In this paper, we address two challenges of subwavelength grating manufacturing: the need for grating with a smaller feature size to produce components working at shorter wavelengths, and the more complex grating design to achieve higher topological charge masks. First, we demonstrate the feasibility of topological charge 2 components (so-called annular groove phase masks) in diamond to be used in the IR region at the K- (1.95–2.35 µm) and H-band (1.48–1.77 µm). The manufactured phase masks are optically evaluated using a coronagraph test bench and a polarization/phase shift test bench to determine peak attenuation, phase shift and local fast axis orientation. Secondly, in preparation for the upcoming generation of extremely large telescopes, vector vortex phase masks for coronagraphy with topological charge 4 are realized in diamond for the L-band (3.4-4.1 µm). These phase masks, consisting of discrete subwavelength gratings, should reduce sensitivity to low-order aberrations compared to topological charge 2 components that we have previously demonstrated for the N- (11-13.2 µm) and L-band. 6 July 2018: A typographical correction was made to the abstract. E. Serabyn, E. Huby, K. Matthews, D. Mawet, O. Absil, B. Femenia, P. Wizinowich, M. Karlsson, M. Bottom, R. Campbell, B. Carlomagno, D. Defrère, C. Delacroix, P. Forsberg, C. Gomez Gonzalez, S. Habraken, A. Jolivet, K. Liewer, S. Lilley, P. Piron, M. Reggiani, J. Surdej, H. Tran, E. Vargas Catalán, and O. Wertz, “The W. M. KECK observatory infrared vortex coronagraph and a first image of HIP 79124 B,” Astron. J. 153(1), 43 (2017). M. Reggiani, V. Christiaens, O. Absil, D. Mawet, E. Huby, E. Choquet, C. A. Gomez Gonzalez, G. Ruane, B. Femenia, E. Serabyn, K. Matthews, M. Barraza, B. Carlomagno, D. Defrère, C. Delacroix, S. Habraken, A. Jolivet, M. Karlsson, G. Orban de Xivry, P. Piron, J. Surdej, E. Vargas Catalan, and O. Wertz, “Discovery of a point-like source and a third spiral arm in the transition disk around the Herbig Ae star MWC 758,” Astron. Astrophys. 611, A74 (2018). D. Mawet, É. Choquet, O. Absil, E. Huby, M. Bottom, E. Serabyn, B. Femenia, J. Lebreton, K. Matthews, C. A. Gomez Gonzalez, O. Wertz, B. Carlomagno, V. Christiaens, D. Defrére, C. Delacroix, P. Forsberg, S. Habraken, A. Jolivet, M. Karlsson, J. Milli, C. Pinte, P. Piron, M. Reggiani, J. Surdej, and E. Vargas Catalan, “Characterization of the inner disk around HD 141569 A from KECK/NIRC2 L-band vortex coronagraphy,” Astron. J. 153(1), 44 (2017). D. Mawet, P. Riaud, O. Absil, and J. Surdej, “Annular groove phase mask coronagraph,” Astrophys. J. 633(2), 1191–1200 (2005). 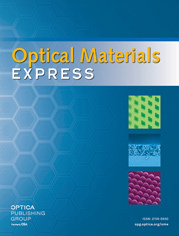 P. Forsberg and M. Karlsson, “High aspect ratio optical gratings in diamond,” Diamond Related Materials 34, 19–24 (2013). E. Vargas Catalan, P. Forsberg, O. Absil, and M. Karlsson, “Controlling the profile of high aspect ratio gratings in diamond,” Diamond Related Materials 63, 60–68 (2016). E. Vargas Catalán, P. Forsberg, E. Huby, A. Jolivet, P. Baudoz, B. Carlomagno, C. Delacroix, S. Habraken, D. Mawet, J. Surdej, O. Absil, and M. Karlsson, “Optimizing the subwavelength grating of L-band annular groove phase masks for high coronagraphic performance,” Astron. Astrophys. 595, A127 (2016). D. Mawet, O. Absil, C. Delacroix, J. H. Girard, J. Milli, J. O’Neal, P. Baudoz, A. Boccaletti, P. Bourget, V. Christiaens, P. Forsberg, F. Gonte, S. Habraken, C. Hanot, M. Karlsson, M. Kasper, J.-L. Lizon, K. Muzic, R. Olivier, E. Peña, N. Slusarenko, L. E. Tacconi-Garman, and J. Surdej, “L’-band AGPM vector vortex coronagraph’s first light on VLT/NACO. Discovery of a late-type companion at two beam widths from an F0V star,” Astron. Astrophys. 552, L13 (2013). C. Delacroix, O. Absil, D. Mawet, C. Hanot, M. Karlsson, P. Forsberg, E. Pantin, J. Surdej, and S. Habraken, “A diamond AGPM coronagraph for VISIR,” Proc. SPIE 8446, 84468K (2012). D. Defrère, O. Absil, P. Hinz, J. Kuhn, D. Mawet, B. Mennesson, A. Skemer, K. Wallace, V. Bailey, E. Downey, C. Delacroix, O. Durney, P. Forsberg, C. Gomez, S. Habraken, M. Karlsson, M. Kenworthy, M. Montoya, L. Pueyo, M. Skrutskie, and J. Surdej, “L’-band AGPM vector vortex coronagraph’s first light on LBTI/LMIRCam,” Proc. SPIE 9148, 91483X (2014). D. Mawet, L. Pueyo, D. Moody, J. Krist, and E. Serabyn, “The Vector Vortex Coronagraph: sensitivity to central obscuration, low-order aberrations, chromaticism, and polarization,” Proc. SPIE 7739, 773914 (2010). A. Niv, G. Biener, V. Kleiner, and E. Hasman, “Manipulation of the Pancharatnam phase in vectorial vortices,” Opt. Express 14(10), 4208–4220 (2006). S. R. Nersisyan, N. V. Tabiryan, D. Mawet, and E. Serabyn, “Improving vector vortex waveplates for high-contrast coronagraphy,” Opt. Express 21(7), 8205–8213 (2013). L. Li, “Use of Fourier series in the analysis of discontinuous periodic structures,” J. Opt. Soc. Am. A 13(9), 1870–1876 (1996). P. Lalanne and G. M. Morris, “Highly improved convergence of the coupled-wave method for TM polarization,” J. Opt. Soc. Am. A 13(4), 779–784 (1996). D. Mawet, P. Riaud, J. Surdej, and J. Baudrand, “Subwavelength surface-relief gratings for stellar coronagraphy,” Appl. Opt. 44(34), 7313–7321 (2005). C. Delacroix, O. Absil, P. Forsberg, D. Mawet, V. Christiaens, M. Karlsson, A. Boccaletti, P. Baudoz, M. Kuittinen, I. Vartiainen, J. Surdej, and S. Habraken, “Laboratory demonstration of a mid-infrared AGPM vector vortex coronagraph,” Astron. Astrophys. 553, A98 (2013). M. Karlsson and F. Nikolajeff, “Diamond micro-optics: microlenses and antireflection structured surfaces for the infrared spectral region,” Opt. Express 11(5), 502–507 (2003). A. Niv, G. Biener, V. Kleiner, and E. Hasman, “Spiral phase elements obtained by use of discrete space-variant subwavelength gratings,” Opt. Commun. 251(4-6), 306–314 (2005). C. Delacroix, O. Absil, B. Carlomagno, P. Piron, P. Forsberg, M. Karlsson, D. Mawet, S. Habraken, and J. Surdej, “Development of a subwavelength grating vortex coronagraph of topological charge 4 (SGVC4),” Proc. SPIE 9147, 91478Y (2014). P. Piron, E. Vargas Catalán, O. Absil, and M. Karlsson, “Birefringence measurements of diamond space-variant subwavelength gratings,” Appl. Opt. 57(17), 4909–4917 (2018). Fig. 1 Upper left, photograph of an AGPM, upper right, SEM micrograph of an AGPM, bottom left, 3D cross section of an AGPM and bottom left, schematic of grating shown in red square, bottom right. Fig. 2 Grating designs for the 8 sector (left) and 32 sector masks (right) showing the first 10 periods. Fig. 3 SEM micrograph of the cross section of a L-band test grating after (left) 28 min of diamond etching and (right) 30 min of diamond etching. The etch mask is still present in both pictures. Fig. 4 SEM micrograph of the structured metal mask for the SGVC4 32-sector component, diamond can be seen as the substrate. Fig. 5 SGVC4 pattern for 8 and 32 sector etched in diamond with Al mask remaining and Al2O3 re-deposited on the sides. Fig. 6 SGVC4 in diamond with mask layers removed, and a thin layer of sputtered Al. Sharp edges are resolved and re-deposited material has not disturbed the structure. During the Al sputtering process the samples were contaminated with carbon nanotubes (from an unrelated experiment), these do not appear to have affected the optical performance. Fig. 8 Images taken at 5.7 µm of the SGVC component placed between parallel (top row) and crossed polarizers (bottom row). Each picture is normalized by its maximum value of the two measurements, using parallel and crossed polarizers, for AGPM-L13r a) and d), for SGVC4-S08-L16 b) and e) and for SGVC4-S32-L17 c) and f). Fig. 9 Measured local fast axis orientation for a SGVC2 (left), SGVC4-S08 (middle) and SGVC4-S32 (right). Fig. 10 Cross-section of AGPM-K1 twin after the tuning etch step. The top of the grating has become faceted and leftover resist can be seen in the bottom of the trench. Fig. 11 Comparison of rejection ratio performance for K1 before and after tuning. Left, RCWA calculation of the rejection ratio, based on the expected depth of the grating (obtained from the cracked sample, solid line), averaged (dotted line) and compared to measured value at YACADIRE (dashed line). Right, RCWA performance map with probable grating parameters, marked with white crosses.